I don't normally share someone else's stuff but I couldn't resist here. This is one of my favorite fly fishing videos to date. I love how they talk about team work and simply fishing for the joy of being on the water. The river backdrop reminds me of one of the rivers I love to fish so I can easily picture myself chasing trout in that same situation. I can't say though I've ever chased a fish that big and envy them for that. I've watched other videos by Todd and I love them all. Let's be honest....right now in eastern Canada (where we are under more than 100cm of snow and fishing season is less than a month away) all of us anglers are itching to get out from under this snow and pursue our own fish of choice. It is now March and that means fishing season is right around the corner. With the winter we've been having, cabin fever is likely in full force. To help calm the summer time shakes I recently organized an event where local anglers could come out and socialize while possibly filling their fly box. I've never before tied my own flies and so I thought it would be a great way for me to learn while we could all share fish stories. Participants listen in while Robin Doull explains and demonstrates some tricks to tying on the big screen. 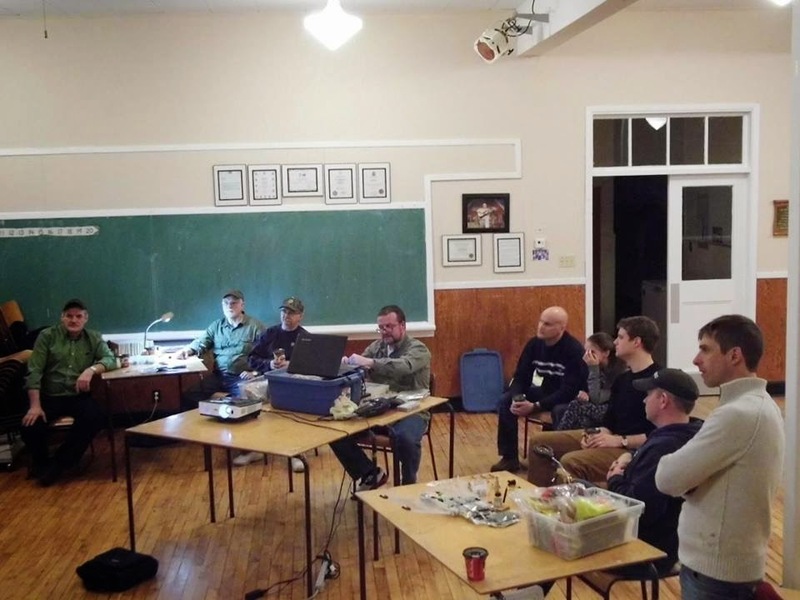 There was a fair turnout for the first, of what we hope will be regular, fly tying event. I am fortunate enough to know a few people who are more than capable of tying fishing flies and I brought in three guys to help lead the evening's conversations. 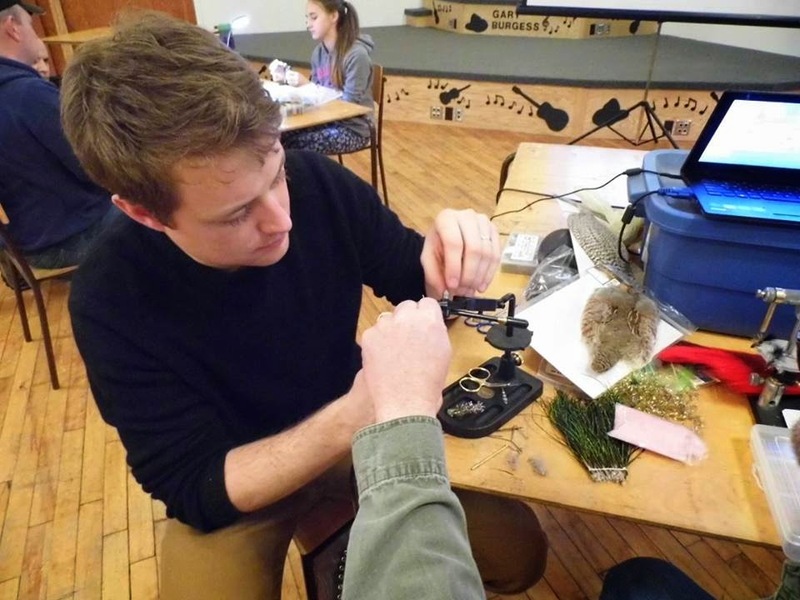 With some capable mentors and a number of eager participants, it wasn't long until hackles and hooks met. A first time fly tyer tries his hand while getting some direction. Since this was the first evening the intent was to start with something easy. "Wooly Buggers" were the fly we started with and by the end of the evening there was lots of examples kicking around. I can't attest to the quality or style of the flies but as someone who tied his first fly that night, I'm certain that those in my position probably felt some level of pride. To take raw materials and create, what some would consider, a piece of art that looks like an actual bait fish, nymph, mosquito, or other bug, is very rewarding. 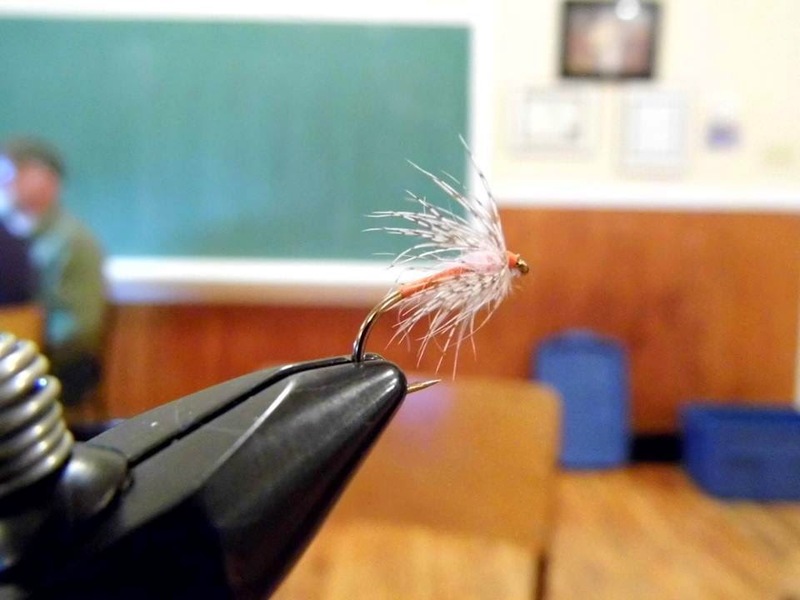 Even if you are not an angler, you would likely appreciate the art of fly tying. The fishing flies can readily relate the creator's mood and personality. If you want to tie a bright colorful fly, there is no lack of chenille, or feathers to choose from. If you want it to be flashy, there are shimmering threads and wires to help with that. If you're in a dark place, there are shades of blacks, blues and grays that can be tied together in combination with various dark threads or simply use one color. This can be especially easy to do if you're not worried about whether or not a fish would take your bait. Ahhh. The fish, when you add the elusive trout or salmon to the mix, that is what separates the true artist from the hacks like me. I tied a greenish "Wooly Bugger" pattern that I have caught trout with, in the past. This fishing season I will now have a new challenge; to catch a trout using my own "Wooly Bugger". This will likely test my fishing skills and patience greatly as I don't think my fly is nearly as presentable as the ones I've used in the past. When you have to worry about how the fly will present itself in the water that is when fly tying becomes the art of imitating nature. I learned a great deal through my first wander into fly tying and maybe the biggest thing to remember is that it is not all about the fish. Patience, an eye for detail, observation skills, and creativity are also a huge part of angling. You need patience while tying the flies as working on small hooks is not something that is best done quickly. You need patience while trying to present that same fly over a school of trout while fighting those same flies that are biting you. Observing the feeding habits of the fish you're pursuing is as important on the stream as making sure you don't prick your finger on that small hook you're tying the fly onto. If you think you might like to learn some of these life/angling skills check out the Kennebecasis Watershed Restoration Committee's website or give them a call. A small fly pattern created by Chris McKnight. Only his second fly. He tied his first earlier in the evening. One of the best things about a long winter is that towards the end, the warmer days tend to be excellent for outdoor adventure. Today our family took advantage of a warm day to get outside and play in the snow and on the ice. The Midland Ice caves have been receiving a great deal of media attention lately and that led to my wife wanting to visit them for the first time. We loaded the kids and the dog into the van and headed from Sussex Corner towards Norton and in 25minutes we were starting up the well beaten and hardened trail towards the ice caves. The first part of the hike was all up hill and the kids needed to stop a couple of times before we made the forested portion of the trail. There were a large number of people enjoying the weather and trail with us. This is normal for this trail we guessed because there was a large snow packed trail the whole way to the caves. There was no need for snow shoes and we even saw some kids wearing sneakers. The kids loved playing in the cave and worked hard to get to the top section of the cave and slide back towards the bottom. The large crowd was full of people who were visiting the cave for the first time and lots of joyful discussion was had. This indicated to me that everyone was loving the day and location. Here is my quick video of the short adventure. There are times when one moment of weakness can ruin an otherwise great day. That happened to me the other day. My wife and I took the kids for a snowshoe trek. It was a beautiful day and the winter time temp was a glorious -7C and when the sun shone on your back you could readily feel it. We were all laughing and having a good time. My plan was to have a nice little fire and snacks along with some hot chocolate. I thought the kids would love to have hot chocolate made over a fire. The idea had the kids excited and when I quickly got a fire going, it was looking promising. The excitement translated to no patience and the kids started bickering with one another. My fire fell deeper than I anticipated and my pot tilted, spilling some water. What was once a promising start, quickly turned to a disaster in the making. Now I was losing my patience too. The kids decided they wanted to forgo the hot chocolate and instead have it at their grand parents. They then decided it would be good to ignore their mother and me when I tried to back her up. This set me off and I lost it. I hollered at both the kids and insisted they stand in front of me while I verbally disciplined them. What was a great day and relatively warm for winter, quickly turned to a cold day. The rest of the hike out I felt as big the downey woodpecker I saw flitting through a stand of poplars. I knew I had over reacted but I also didn't think I could apologize without undermining my own authority. I pulled my toque down and weathered the storm. By the time the hot chocolate was done I think all the hollering was forgotten.